Although those figures sound alarming, researchers at the University of British Columbia (UBC) are one step closer to understanding — and treating —pediatric diseases such as colitis, Crohn’s disease, and others under the IBD umbrella. 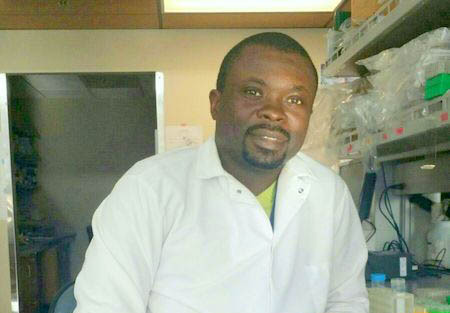 Under the supervision of Dr. Laura Sly of UBC’s Department of Pediatrics, Eyler Ngoh, a PhD student, wanted to build on his previous research on the impact of an enzyme called SHIP. His initial work indicated that patients with low levels of SHIP experienced increased inflammation, a symptom common in IBD. Eyler and Dr. Sly partnered with the BC Children’s Hospital, Child & Family Research Institute (CFRI), and a Vancouver company called Stemcell Technologies Inc., which provides stem cell-related products and services to the scientific community and frequently collaborates with researchers in British Columbia. With the two partner organizations, the researcher undertook an 18-month internship through Mitacs’ Accelerate program. Eyler worked on site at CFRI, where he and the research team compared intestinal cells in patients with Crohn’s and those of a control group. They learned that there was an inverse correlation between SHIP levels and those of a protein called “IL1 beta,” which may play a role in stimulating intestinal inflammation. Since the project concluded, Eyler received his PhD and published a paper on the results of his Mitacs research in Gastroenterology. With his team, he plans to continue his research and determine which patients may benefit from existing IL1 beta-blocking medications, potentially helping sick kids feel better without major surgical intervention. In addition, the research will help Stemcell Technologies Inc. explore possible products while increasing their own in-house scientific knowledge.